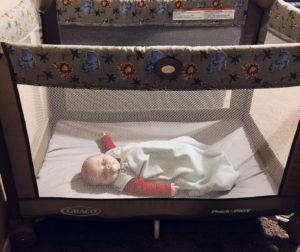 Safe sleep in a Cribs for Kids® pack and play. In 2008, the Healthy Start Coalition entered into a partnership with the Cribs for Kids® Program administrated by SIDS of Pennsylvania. The Safe-Sleep initiative was created because of the number of infant deaths attributed to unsafe sleep practices. When funding is available, Healthy Start provides a safe place for newborns to sleep by distributing Cribs for Kids® pack and plays. Caregivers are required to watch a safe sleep educational video and receive written safe sleep educational material. They are also verbally instructed on all safe-sleep guidelines.